Ask Grandma and Grandpa! They know..
Home > Blog > Ask Grandma and Grandpa! They know.. In a world that celebrates Mothers’ Day, Fathers’ Day, Siblings’ Day, and Dog Day—you better believe that there’s a National Grandparents’ Day. And wouldn’t you know it, Grandparents’ Day is today! I’ve previously written about the history of the day on this Blog—how it came to be and ways that you can celebrate. But today I’d like to share with you three things that you can learn from Grandma and Grandpa. Some people may think it’s hard for the younger generation to relate to their grandparents, but kids love learning about new things. Grandparents may only have ‘old tricks’, but they’re new to kids of the modern day. Here are a few things we can glean from our grandparents. History is always more fun to learn about when you’re learning it from a source who actually lived through historical events. It can be lots of fun for kids to compare how different the world is that they are growing up in and the ones that their grandparents did. Grandparents are also typically good sources for learning about your family tree. Because grandparents grew up in a different time, they know skills that kids from your generation never had to learn such as sewing, baking, woodworking, gardening, letter-writing and so on. Grandparents can also help you out with games that you probably never heard of before. When I was younger, my grandfather taught me to play an old card game called Sheep’s Head. 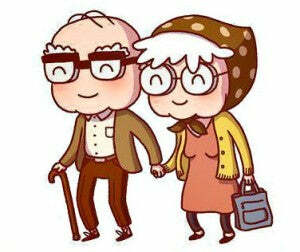 Your grandparents have been through many more walks of life than you. Turn to them for life lessons and advice about situations where you could use the input. Grandparents know how to get through hard times and they know how to help your social skills with some playful humor. Enjoy your visits and see what you can learn from your grandparents! And don’t forget to wish them a happy Grandparents’ Day! As always, thanks for reading.